Researchers identify new epigenetic pathway in drug-resistant melanoma. A new collaborative study led by researchers at Sanford-Burnham Medical Research Institute provides new insight into the molecular changes that lead to resistance to a commonly prescribed group of drugs called BRAF inhibitors. The findings suggest that targeting newly discovered pathways could be an effective approach to improving the clinical outcome of patients with BRAF inhibitor-resistant melanoma tumours. The opensource study is published in the journal Cell Reports. The team state that melanoma is the deadliest form of skin cancer, killing more than 8,000 people in the U.S. each year. Approximately 50 percent of melanoma tumours are driven by mutations in the BRAF gene, and patients with these tumours are prescribed BRAF inhibitors. Although BRAF inhibitors rapidly and effectively shrink tumours, their success is limited because most tumours become resistant to the drugs within a few months. Previous studies have shown that melanoma tumours can develop resistance to BRAF inhibitors by using alternate signaling pathways that promote cell growth. The current study has identified a different pathway, JAK1, as a driver of resistance to BRAF inhibitors, and suggests that targeting JAK1 could overcome such resistance, thereby improving the durability of the response to BRAF inhibitors. The researchers analyzed BRAF inhibitor resistance in melanoma cell lines using mice bearing human melanoma tumours and in human tumour biopsy samples. The results found higher levels of JAK1 in resistant tumours, which caused increased expression of epidermal growth factor (EGFR), a receptor tyrosine kinase that promotes cell proliferation. The increase in JAK1 was due to low levels of the protein that regulates its expression, ubiquitin ligase RNF125. Previous studies have shown that JAK1 is part of a well-studied regulatory network of proteins that is involved in the control of cell growth, differentiation, apoptosis, inflammation, and immune response. Until know, JAK1 was not known to play a role in melanoma or its resistance to therapy. The team surmise that by understanding that lower levels of RNF125 confer resistance to BRAF inhibitors the medical community now has a new strategy to stratify patients for currently approved therapy versus participation for human clinical trials. They go to add that it is in this way research teams can investigate whether targeting JAK1 will be more effective in patients whose tumours exhibit reduced RNF125. The researchers conclude that it will be important to determine whether JAK1 therapy alone or in combination with EGFR and BRAF inhibitors will elicit a better response. RNF125/JAK1 pathway is associated with RTKs related to BRAFi-resistance. 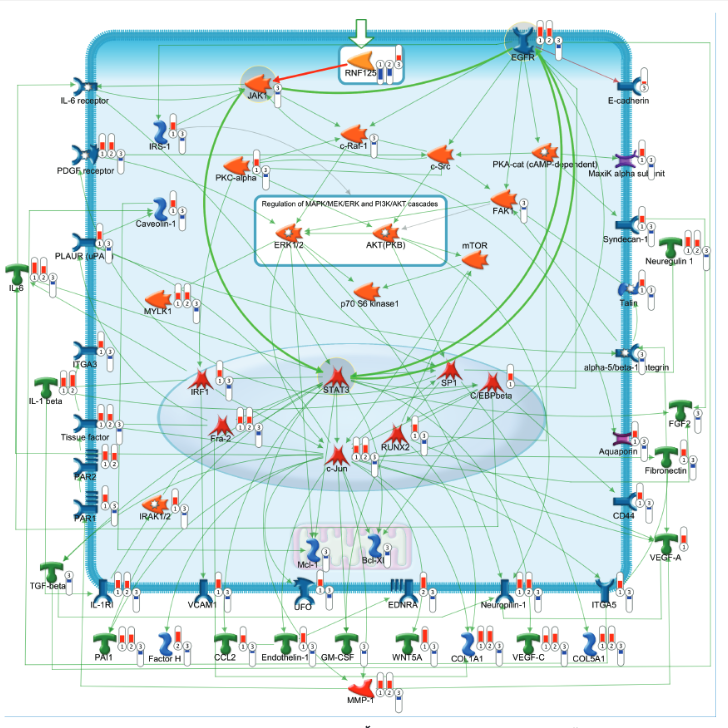 MetaCore based analysis for RNF125-related pathways. The details on pathway analysis can be found in Extended Experimental Procedure and legend for the symbols at https://portal.genego.com/legend/MetaCoreQuickReferenceGuide.pdf. Downregulation of the Ubiquitin Ligase RNF125 Underlies Resistance of Melanoma Cells to BRAF Inhibitors via JAK1 Deregulation. Kim et al 2015.